Now you can show data in more organized form using tables in Presentations created online at Google Docs. New insert table feature allows you to add and format tables as per requirement. To get started, goto menu option Table > Insert Table and then select number of rows & columns for the table by selecting boxes in the grid. 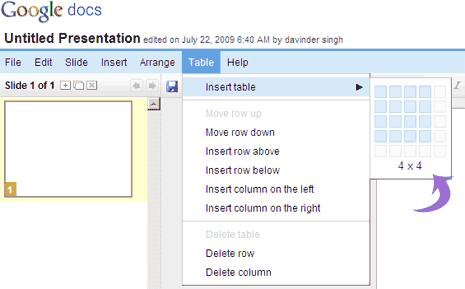 You can easily format structure of table in your presentation slide by using options under table table. You add or remove columns and rows, move rows up and down. You can also change border color and thickness of the table using “Outline color and size” button in the toolbar (the one with the pencil icon above a line next to color bucket icon).